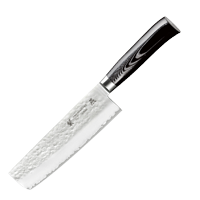 Tamahagane San Tsubame are a premium brand of Japanese steel knives, produced in the city Niigata and are made from the highest quality of materials. 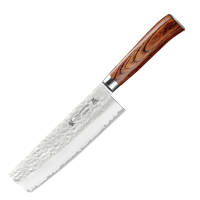 The blade is a 3-ply construction with a hand hammered finish. The inner core of steel is VG5 and is the perfect type of steel to take and hold a very sharp edge, this is then 'cushioned' between 2 layers of softer SUS410 steel. This composition allows a very hard inner layer of steel, the VG5 is hardened to 61° of Rockwell hardness, without the problems of brittleness as the outer layers of SUS410 remain at a hardness of 28° to 32° of Rockwell hardness.